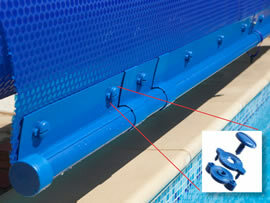 The UK’s leading supplier of innovative pool products. The Monaco telescopic reel is one of the most popular reels on the market. Monaco fixed reel powered by solar energy, with remote control options. Our Commercial Monaco Reels save time, energy and money. 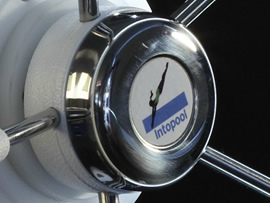 Based in Edenbridge, Kent, but providing a high quality service to trade customers all over the UK, Intopool has over 30 years experience in the industry and is known for giving the customer the very best in quality products and customer service. As a leading distributor and manufacturer of pool products, Intopool is constantly striving to deliver the very best quality and value to our customers. The products shown here are top of the range which have been designed and manufactured for strength, durability and ease of use. 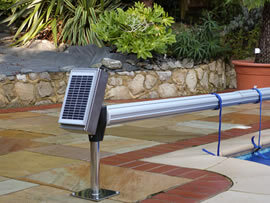 They have also been designed to look stylish beside your pool. Just wanted to let you know that we installed the Monaco Roller and AquaSpoiler yesterday and all went well. The alterations that you have made to the AquaSpoiler have greatly enhanced the product and made it much easier to fit. The reduced height roller looks really good and in my opinion the Monaco is the best domestic roller available in the UK. You manufacture some really nice products. 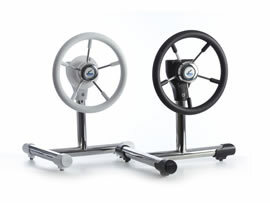 There are a number of pool showrooms around the country that have a demo Monaco Reel with AquaSpoiler and SmartGear, so if you would like to see one, please contact us and we will let you know where your nearest swimming pool shop is. All of our products are designed to meet the needs of the installer and end user and are manufactured to the highest standard. They are high quality, innovative products and there is nothing budget about them. At Intopool, we pride ourselves on our passion and commitment to innovative, industry leading products that make life easier for our customers. All of the components needed for the manufacture of our fantastic products are sourced from other local manufacturers, so we are proud to claim that our products are ‘made in Britain’.